My first foray into cleaning sticks! 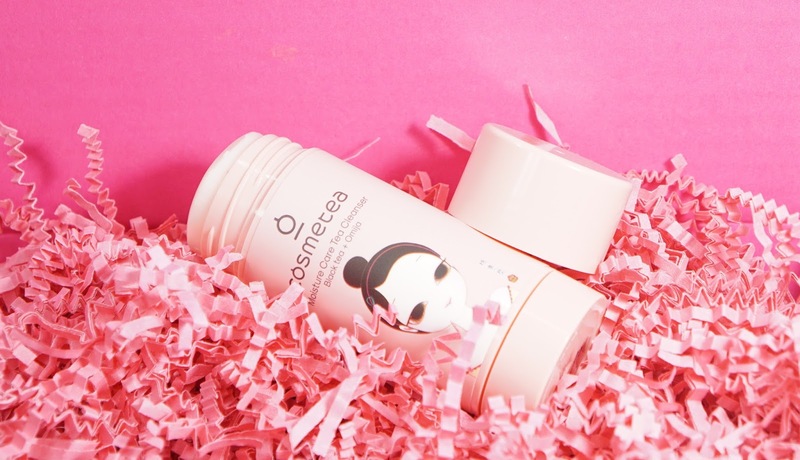 Memebox kindly sent me the Cosmetea Moisture Care Tea Cleanser in Bleack Tea + Omija* for free to review as part of their Memebox Ambassador program and I was so excited to try it out. 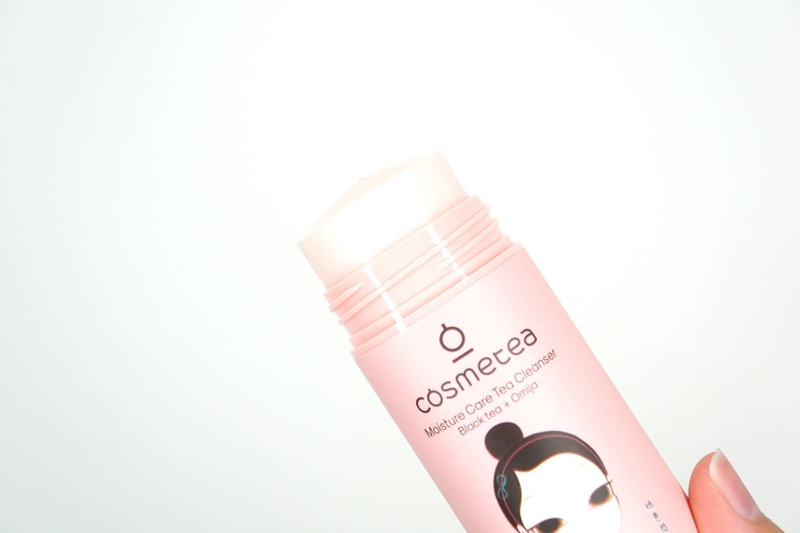 This cleansing stick works as a makeup remover and cleanser and so it's great as a travel skincare product. There is 65 grams of product and retails for $19 on the Memebox website here. The packaging is super handy in that it's a roll up stick with a twist off cap and feels sturdy even though it's plastic. It does remind me of solid deodorants though and so I keep thinking I'm spreading deodorant on my face. I tried to create a gif to demo it but the B&A pictures are below! In the middle of the gif, I did go to the sink to add some water onto the cleanser and so that's why there was a slight gap on how messy my hand looked. To use this cleanser, the first step is to gently massage the stick over dry skin and then rub/spread the product out with your fingers. For me, I did get worried while doing this step because it felt like I was rubbing a day's worth of dirt, oil, and makeup into the actual product. I would see makeup onto the actual stick and get slightly grossed out but it washed off so easily that I stopped worrying about it after the 2nd or 3rd use. I usually went over my dry face multiple times with the stick because this is not a "less is more" kind of product. If I didn't put enough, my fingers couldn't glide over my face as well as it could and so I felt like I was being rougher to my face compared to using a cleansing oil or something. There is a lot of product though and so I wasn't too worried about using a lot. For the second step, this product just need to be emulsified with some water. It would become a bit milky and then foam up. The gif isn't the best example since I added too much water too my hand but I was able to normally get a pretty nice lather. For my dry skin, I felt like this product wasn't moisturizing enough for me like cleansing balms or cleansing oils are but I believe it's because of the foaming part of this product. I've also read that this product has a pH level of 7 or 8, but I don't have pH strips to test/confirm that. I didn't love this part of this product, but I was able to put up with it since I usually use super moisturizing products after cleansing anyway. As a makeup remover, this product did pretty well! I did have some slight problems with my waterproof mascara, but that's with every makeup removing product I've tried. If I needed more help even after doing the second step, I would just rub a bit more on my finger tips to really message it into my lashes and I would get everything. Final thoughts: I don't like this product as much as my regular cleansing balm and foaming cleanser, but it's such a good all-in-one product especially when I'm not at home to use my regular products. Since it's not liquid, I also don't have to worry about it leaking while I'm on a plane. I also like that I just need to use one product instead of 2 to clean my face. I'm not in love with this product though but it did make me curious about other cleansing sticks to see if they're less drying. If you have oily skin, I would still check this out! It's handy, easy to use, and works to remove makeup and clean my face. *Memebox sent me this product for free to review. I was not compensated and was only asked to give my thoughts on it. All opinions are my own and 100% honest.